70 years ago, Japan signed an agreement of formal surrender on an American warship in Tokyo Bay. The anniversary of this event will be marked in Beijing today, September 3rd by a massive military parade in which Chinese and Russian soldiers march together. President Xi Jinping’s most important guest during the parade will be Russian president Vladimir Putin. Thanks to Putin, the memory of World War II has shifted from Europe to Asia. Xi and Putin will celebrate their joint victory over German Nazism and Japanese militarism. When Russia invaded Crimea and sent troops into eastern Ukraine last year, an ice front was created in Europe that made it impossible for Russia and Ukraine to commemorate the Great Patriotic War together. Xi was the only high-profile guest during the parade held in Moscow on 9 May. Angela Merkel arrived only afterwards. 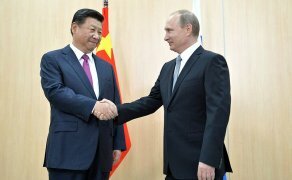 The partnership between Russia and China is now being reaffirmed. West and Central Europe’s wartime history has been put in parentheses. Even the US War in the Pacific War is played down. One result of the “Asiafication” of the memory of war is that less emphasis is being placed on reconciliation. Instead, World War II is being used to emphasize the lines of conflict in the world today. Xi and Putin have some good reasons for drawing attention to the wartime roles of their respective countries. Russia and China suffered the greatest losses by an overwhelming margin. Approximately 20 million people lost their lives in the Soviet Union and 14 million in China. The losses suffered by Western nations pale in comparison. In addition, World War II lasted longer in Asia. The Sino-Japanese war commenced on July 7th, 1937 and ended on August 15th, 1945. In Europe, the war began on September 1st, 1939, ending on May 8th, 1945 (May 9th according to Stalin). In his book Forgotten Ally, the British historian Rana Mitter argues that China’s key role in World War II was forgotten during the Cold War and deserves greater attention. Mitter is now receiving assistance from Putin. In today’s speeches, Putin and Xi will emphasize the Soviet Union’s strong support for China during 1937–41. Western powers did little. Only when Japan moved into French Indochina in 1940–41 did the United States react by imposing an oil embargo. The United States did not enter the war until December 7th, 1941, when Japan attacked Pearl Harbor. Meanwhile, Soviet and Mongolian troops had inflicted a humiliating defeat on Japan at Khalkin Gol in northern China. This helped Russia to avoid a two-front war against both Germany and Japan. Instead of realizing its plans to secure Siberian oilfields for its own benefit, Japan turned its attention southwards. In their commemorating speeches, Xi and Putin will also highlight the Soviet offensive in Manchuria of August 9–15th, 1945. In their opinion, this offensive was just as important in forcing Japan to surrender as were the atomic bombs dropped by the United States. 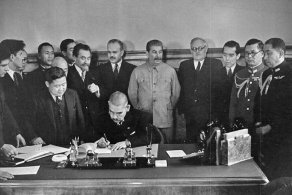 Japanese Foreign Minister Matsuoka signing Soviet-Japanese Neutrality Pact. Xi and Putin will omit or play down some aspects of wartime history. They are likely to steer clear of the non-aggression pact that Stalin entered into with Japan on 13 April 1941. Stalin did not revoke this pact until four years later, and only breached it with the invasion of Manchuria on August 9th, 1945. A decisive factor in the victory of the Soviet Union in 1945 was that Germany and Japan did not attack simultaneously. In 1936, Japan, Germany and Italy signed the Anti-Comintern Pact. Hitler betrayed Japan when entering into a non-aggression pact with the Soviet Union on August 23rd, 1939, in the midst of General Georgi Zhukov’s offensive against Japan at Khalkin Gol. In 1941, it was Japan’s turn to sign a pact with Stalin, three months before Germany invaded the Soviet Union. The pact allowed the Russians to focus on the war against Germany and the Japanese to challenge the United States. At this point the United States took over Russia’s previous role as China’s main ally. Xi is scarcely likely to emphasize the fact that China’s war against Japan was mainly fought by Chiang Kai-shek’s Nationalist Army, rather than by Mao’s Red Army. Even though Stalin managed to get the Chinese Communists and Nationalists to work together from 1936 onwards, the Communists for the most part avoided meeting the Japanese in open battle. Instead the Communists concentrated on securing popular support in the countryside and build up an army for later use in the Chinese Civil War. The Nationalists’ war efforts are now commemorated mostly in Taiwan, where Chiang sought refuge when the Communists took over China in 1949. It is interesting, however, that the Nationalist Kuomintang party’s former leader Lien Chan will attend the parade in Beijing. Japan’s war crimes will be much in focus. All Chinese schoolchildren learn about the Nanjing Massacre of December 1937. On August 14th this year, the anniversary of the Japanese emperor’s decision to surrender, Japan’s prime minister Abe Shinzo made an historic speech in which he distanced himself from the “wrong course” adopted by Japan in the 1930s and expressed remorse for the suffering that Japan had inflicted on others. Abe affirmed apologies issued by previous Japanese governments and made a direct reference to “aggression”. Doing so was problematic for Abe, who is an old-fashioned Nationalist. War crimes committed by Stalin, Mao and Chiang will not be among tomorrow’s topics. The single worst event, measured by the number of lives lost, was Chiang’s decision in the summer of 1938 to breach dykes in order to flood the areas into which Japan was planning to advance. While this was strategically astute, at least 500,000 Chinese drowned in the floods. Chiang the Christian moralist knew what he was doing and never expressed regret: he thought great sacrifices were necessary in order to realise the dream of resurrecting China as a strong power. Although Xi is the leader of the Chinese Communist Party, he resembles Chiang more than Mao. Xi is not waging a class war, and is no revolutionary. His dream is of a strong China, and he sees Russia as his close partner. The big question is how he will tackle the United States. One aspect of the United States’ wartime history has garnered much attention in China this year: General Claire Chennault’s “Flying Tigers” – squadrons of fighter aircraft that operated from bases within China and boosted Chinese morale. In September, Xi will travel to the United States to meet Obama and deliver China’s opening address to the UN General Assembly. The September 3rd parade is intended to boost his strength. For Xi it is crucial that neither falling stockmarkets, toxic chemicals explosions, or Korean crises distract attention from China’s great parade. It is intended to underpin China’s dream of becoming the world’s new superpower, on a par with the United States. This text was first published in Norwegian 2 September 2015 in the daily Klassekampen: “Krigshistorien sett fra øst”.